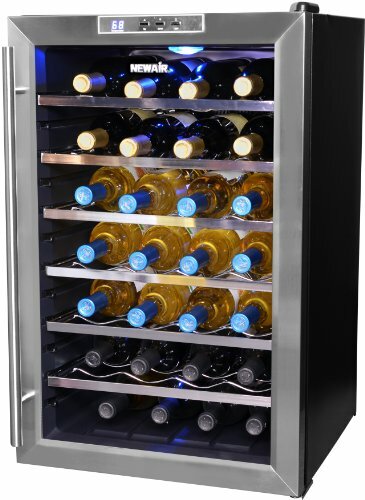 The Avanti EWC1201 wine cooler is a compact 12-bottle unit that uses thermal electric refrigeration (also known as superconductor or Peltier technology). With its 10″ width it fits in narrow space, and the small footprint makes it ideal for counter or tabletop placement. See the technical features, pros and cons, as well as customer complaints in detail below. Door: double-pane curved glass door with a narrow platinum finish trim, non-reversible hinge. Cooling method: thermoelectric (Peltier) cooling with auto defrost Number of zones: one Built-in/Freestanding: freestanding only (ambient temperature: 72°F – 78°F/23°C – 26°C), allow 5″ clearance around the sides at the back and the top. Thermostat (Mechanical/Digital): adjustable digital thermostat – touch button controls with “autolock” feature (the buttons will be locked 12 secs after the last button has been touched). To unlock the control panel press the Up and Down arrows simultaneuosly for 3 secs. A beep sound lets you know that the control buttons are activated. Interior Light: low-intensity LED lighting, you can turn it on/off by pressing the button marked with a bulb symbol (after 10 minutes the lighting will automatically turn off). Price range: $100 – $130 ($8.3 – $10.83 per bottle). 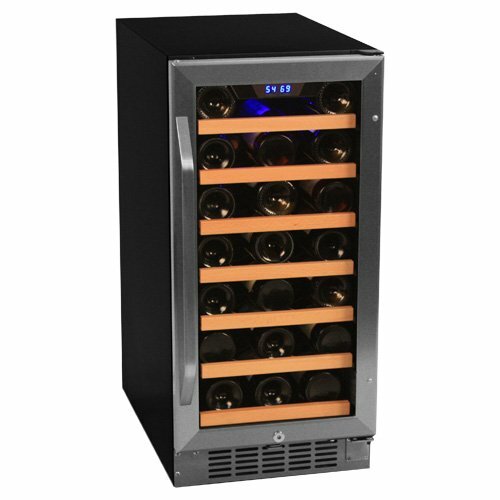 Go to main page of Avanti Wine Refrigerators. Read also a review on the Avanti SWC1600M-1 16-Bottle Wine Cooler and the Avanti EWC1802DZ 18-Bottle Dual-Zone Wine Chiller. 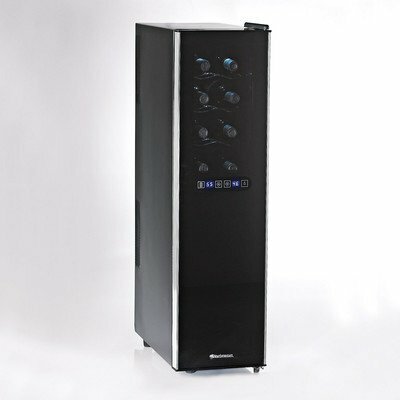 Haier 12-Bottle Wine Coolers review of 12-bottle models by Haier. 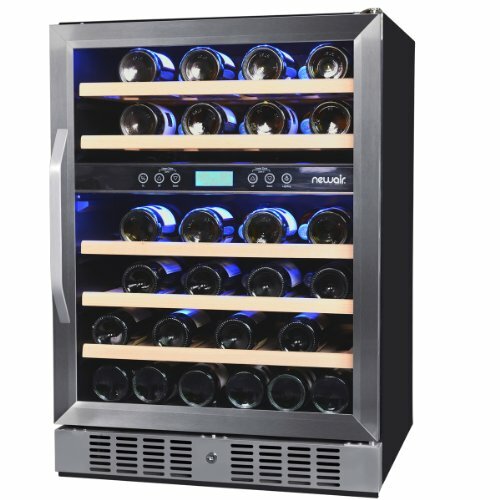 Thermal Electric Wine Coolers – find out how thermal electric coolers work and what are their advantages over compressor-based fridges. 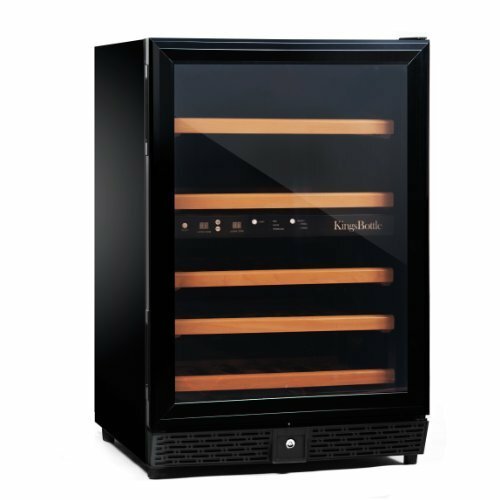 NewAir Wine Coolers – cheap thermal electric home cellars ranging from 12-bottle to 23-bottle capacity.